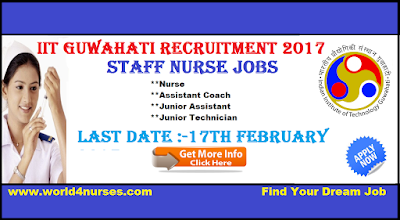 it is a Great Opportunity to get a Job Interested candidates can Apply through On-line Eligibility for Application is 10th Intermediate and Diploma in General Nursing Midwifery or Bachelor Degree in Nursing,Bachelor Degree in Physical Education or Any Bachelor Degree, Various Vacancy details,Jobs Description,Number of Vacancies,Maximum Age limit,Pay Scale for Month, Details Eligibility qualification, Educational qualifications,Desirable qualification, Mode of apply Time and Date of the registration,Walk in Interview, Information about IIT Guwahati Recruitment 2017 Central Govt Staff Nurse Vacancy Related details given below. Persons with B.Sc Nuring qualification experience will be given preference. How Nurses can join in Indian Military Nursing Service.